The 31 STATES called "Lesre,"
Southwest, Northwest, Northeast, Southeast, East, East-Central. Bergonia AT A GLANCE -- basic facts and figures. Also see the SITE MAP for a list of topics. A large, square-shaped continental island located in the North Atlantic between Bermuda and the Azores. With no major bays indenting its mass, and no significant peninsulas, save for Pasiana in the northeast, Bergonia stretches almost 1200 miles from west to east (counting islands), and 900 miles from north to south. Approximately 1,090,132 square miles in area, making it (depending on one's point of view) the world's smallest continent or largest island. Bergonia's mass equals 37% the area of the continental United States. The land mass extends from 43 to 62 degrees west longitude, and from 24 to 36 degrees north latitude. 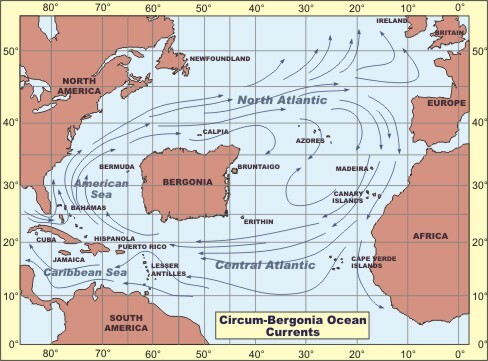 The Gulf Stream circles around Bergonia's west, and then to the north. The tranquil green Sargaso Sea reposes off Bergonia's east side. Bermuda lies 150 miles off Bergonia's western coast. The Azores are 500 miles from the northeastern tip of the Bergonian land mass. See the detailed description of climate & seasonal weather. Bergonia's position on the globe insures a balmy, subtropical climate, albeit somewhat unpredictable. Climate here is determined as much by altitude, as well as latitude. The mountainous topography produces thousands of microclimates, where climate and vegetation change radically in the stretch of just a few miles. Temperature: The lowlands remain warm or at least mild all year long. But two thirds of the land mass consists of uplands-- mountains, plateaus and high tablelands-- and the higher the altitude, the cooler the weather (typically 5º cooler daytime highs per 1000 ft higher), so that the uplands often get cold winters. Thus the highest mountain ranges (over 10,,000 feet high) wear year-round crowns of ice. Rainfall: The southeastern lowlands, most affected by the summer Trade Winds, get only 12-17 inches of a year. On the opposite extreme, windward slopes in the extreme northwest get as much as 80 inches. The many variations in altitude cause great variations in rainfall, often within very short distances. One side of a mountain range may catch as much as 60 inches a year, while the other side gets only 15. In winter cold moist air originating over North America moves in from the west. Eastern and southeastern Bergonia remain shielded from this continental air, and so remains warm and dry. On the high Ifuno Plateau, and in the high mountains, temperatures get quite cold, and it does snow. In late spring and summer the Azores high pressure system spreads over Bergonia from the east. The western side of stable high pressure systems often produce volatile weather, so Bergonia sees many isolated thunderstorms in summer. Hot Trades Winds blow over southern Bergonia. In autumn tropical storms and hurricanes roll up from the south. Southwestern and western Bergonia often get soaked this time of the year. population, density, language, etc., by state. These files are each so big that you have to scroll over it from side to side, from top to bottom. Though impossible to view as a whole, these maps show Bergonia in great detail, with all major place names. The Huge Political Map, .gif, 3200 pixels wide, highlights counties and cities, also shows major highways. The Monster Topographical Map, .jpg, 4500 pixels wide, shows rivers, cities, counties and highways. I composed all the maps, charts, graphs and pictures on this site with CorelDraw 12 and earlier versions. CorelDraw is comparable to the more popular Adobe Illustrator. The companion program, Corel PhotoPaint, has come in handy for importing, handling and editing bitmap images, including photographs. I am particularly pleased with how well CorelDraw handles color, and how easy it is to edit & manipulate large, complex objects (like Bergonia itself). Earlier I sampled some drawing programs dedicated specifically to map-drawing, and found them lacking in flexibility and range. They of course have no capacity for charts, graphics or pictures, and seem to have limited ability to produce thematic maps. For any prospective map-makers who is ready to use a drawing program like Corel Draw, or even a CAD program, my chief word of advice is to use layers. If you keep different map elements on different layers (e.g. topography on one layer, roads on another), you'll find it much easier to edit maps, and also to avoid unnecessary duplication in starting new maps. --J.C.